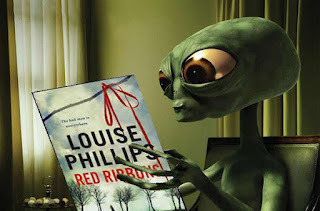 Louise Phillips Writer: RED RIBBONS PICTURE COMPETITION - THE RESULTS!!!! How can you choose a winner, when everyone who took part in the RED RIBBONS picture competition was indeed a winner, entering into the fun element of it all, giving me, and I hope a lot of other people, including some four-legged creatures, great enjoyment with their very special RED RIBBONS photos! So, before I announce the winner, and by way of saying THANK YOU to you all, I've done a small video of these very special photos which I hope you will enjoy, and please, please feel free to share your Beautiful Pictures!!! But as the moment is now here, I'm delighted to announce that the winner in the Adult Category of the RED RIBBONS Picture Competition, who will receive a signed copy of 'Red Ribbons', 2 Tickets for The Loose End Theatre, for Three Voices/Three Forms for Wednesday 14th November, and a signed copy of 'The Doll's House' when it's released in 2013, is Abby Wynne for this, you must agree, Out Of This World picture!! But, because I've been blown away by the wonderful images, I'm also pleased to announce that the winner in the Teenage Category of the RED RIBBONS Picture Competition, is Darragh Kempson, a budding author, who will receive pocket notes books to help him with his writing craft. And, because all children are winners, the following two prizes will go to the wonderful and crafty A'isha, aged 8, and the powerful, Riley, aged 4, who both sent in mega pics! A'isha is thrilled silly! Thanks Louise. Excellent choice of winner BTW. Excellent choices Louise! Lots of fun! Thanks Katy - I want a pic with the hero in it!! !